Mentoring Millennials is regarded in corporate America as a "nice" thing to do, but often is overlooked in the controlled chaos. However for millennials, mentorship is a way to help them translate what they learned in college into real world experience. But the benefits of mentoring millennials does not end there. Studies have proven that mentors who are 86% more engaged in their own role within the company. 00:00 Amanda Hammett: Hey, this is Amanda Hammett, and this is the Millennial Rockstars podcast. 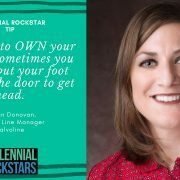 Alright, in today's episode, I have Jordan Donovan, from Valvoline, and she's gonna break some major millennial moulds right up front, because she has been at Valvoline since the day she graduated from college, 13 years ago. So I want you to listen in and find out how Jordan learned to step up and make herself known instead of just waiting and hoping that her hard work was gonna get her the recognition that she deserves. Join us in the episode. 00:31 Amanda Hammett: Hey there, this is Amanda Hammett, The Millennial Translator®. Thank you so much for joining us today. We actually have someone also from Valvoline. This is Jordan Donovan. Jordan, how are you today? 00:43 Jordan Donovan: I'm good, thanks for letting me call in. 00:45 Amanda Hammett: Oh you're so welcome, thanks for coming in. So tell us a little bit about you, Jordan. 00:52 Jordan Donovan: I have been working for Valvoline for about 13 years in a variety of roles. I'm a Lexington, Kentucky native, so I've pretty much been here since high school, and college, just a short 20 minutes away. 01:05 Amanda Hammett: Oh, nice. 01:06 Jordan Donovan: Yes, I'm a mom to a five-year old little girl and three-year old little boy. 01:10 Amanda Hammett: Oh, fun, fun, fun, fun. So, alright, I know that you've done a variety of things since you've been at Valvoline. Tell us about that very first role transitioning out of college in the classroom into the real world, so to speak. What was that like? What was that first role, and what was that like for you? 01:36 Jordan Donovan: Well, when I left college, I came over to Valvoline and started working in customer service. And my father had also worked for the company so I kind of got my foot in the door to get some jobs, and just some good experience working in customer service learning how to deal with conflict management and problem solving. So it was a very good experience. I worked for there about a year and then was able to be promoted into some additional roles. 02:27 Amanda Hammett: Deal with the general public. So that's really, really, really cool. So now you've been again with Valvoline for quite a while. The national average or millennials are often made fun of for job hopping. 13 years is not exactly what I would consider job hopping though. 02:47 Jordan Donovan: That's true. 02:47 Amanda Hammett: So you've [laughter] been there a little while. Have you had any stumbling blocks so far in your career, in those 13 years? 02:58 Jordan Donovan: If you look at my resume, most of the jobs I was in for about three years before I moved on. Some of those, I definitely think, gave me the skill sets that I was able to use for future roles, but I think some of my mentality for the first few years was my work will be my track record and they'll see that and promote me. But the last probably, couple of years, as I've built some mentor relationships, they've been teaching me, you gotta own your career, you gotta get out there, put your foot in the door and try to get a head above everyone. So having mentors, I think has definitely helped me with some of the stumbling blocks that I faced in prior years just because I have champions now who are bringing my name to the table in some discussions and giving me project work or working with my current supervisors to just showcase some of my skills. So that's probably helped me in the last few years where in past, I probably was like, "I'll just work really hard, and they'll promote me eventually." That didn't always work, I think. 04:00 Amanda Hammett: Oh, that's wonderful. I'm sorry you had to go through that experience of not figuring that out, but I'm so glad that you did figure out this getting a mentor. I think mentorship is one of the things that I advocate most for. I think, that is incredibly important on both sides of the table, whether you're the mentor or the mentee. But tell me, Jordon, how did you get this first mentor? Tell me how that came about. 04:25 Jordan Donovan: So my boss in a former role, she kinda moved into a different role, and we started a mentor program here. So we kinda kicked off a pilot program, and they matched people up with skill sets. So one of the things I wanted to work on was command skills. Just being able to present in front of an audience and have confidence. And there was only one person that also checked that as a strength. So we got paired up and just through conversations, they helped provide a little bit of feedback on opportunities I could work on for my command skills. It's always a work in progress for me, but I definitely think they've helped strengthen that skill set. 05:03 Amanda Hammett: That is amazing. I love that you knew this about yourself, and that you did something about... To further that skill, regardless of the fear because I know that the thought of presenting in front of people is scary to most people. I do it a lot, so it's different for me but most people, it's a major fear. And I'm glad that you attacked it head on. That's really cool. And I think that that's really good for your career as well. Have you noticed a difference now in your growing comfort level with giving presentations in front of people, have you noticed a difference? And I don't really know the right word I'm trying to use here, but have you noticed a difference in how you feel like you're perceived by other people, especially the people above you? 05:52 Jordan Donovan: Yes, and I think just kind of owning my work and presenting it too. Where, probably in past years, I'm like, "I'll do this presentation. I'll do this analysis, and I'll hand it off." I've been trying to take those opportunities to say, "Can I go present that? Can I have that experience?" And I probably stumbled through several of them, but I think as I said, I'm getting better and more confident with each one. So continuing to volunteer for those opportunities when they arise. 06:18 Amanda Hammett: And there is no substitute for that face time because a lot of times when people above you, when they're thinking about a presentation, even if it was a group effort, they tend to remember the person that actually presented it; whether they did none of the work or all of the work, that's the person that they most associate. It's that's facial recognition, and they have put that face with that group. So good for you for stepping up and for going forward with that. Now, have you had any other relationships with mentors, or is it just this one? 06:50 Jordan Donovan: So like I said, this year, I sat with my mentor and I was like, "I kinda wanna branch across. I thought maybe I'd like some marketing or some digital experience in my next five to 10-year career plan." So about a year ago, I added an additional mentor in the marketing department. So she's director of one of our brands. So we meet quarterly. We've been busy. There's been a lot of changes going on this year, so we probably haven't met as regular. And then, I added in a VP as well. So we were gonna meet quarterly, twice a year. We were gonna try to meet occasionally. He ended up leaving the company, so I'm kind of searching for that again. But just getting their feedback, how they kinda navigated their career paths, some stumbling blocks they may have had to watch out, and just getting their feedback on things they may have learned from that I can use to my advantage. 07:37 Amanda Hammett: Absolutely. I think that that is... I think that you're doing it; that's fantastic. The feedback that you're willing to take, and just putting yourself out there in new and different roles; that's serious growth, and that's where a lot of things start. So I feel like women in particular tend to be a little more, "Oh, I'm gonna let my work speak for itself." And although you might be the best person at this particular job, sometimes it's the person that puts themself out there that is the one that gets the promotion or the one that gets the recognition. So good for you. Good for you for doing that. I love it. So now... Is there anything that... We've talked about the mentors. Is there anything that a particular boss in the past, and in your various roles, or maybe even a co-worker has done that really keeps you engaged, or keeps you really wanting to get out there and do good work for Valvoline? 08:38 Jordan Donovan: I've been fortunate that I've had great leaders in most of my roles, and as I've kind of made efficiencies and processes and had additional bandwidth, I can reach out to them to say, "You know, I'd really like to cross-train on a different product line, or pick up some project work." So they've always been open to that. Our company is great; they do tuition reimbursement. So I had worked here about a year, and I decided I'd like to go back to school and they paid for my MBA. So they're amazing about those opportunities. And then, most jobs, there's been certifications or skillsets that we can do. So I did my... When I worked in pricing, I became a certified pricing manager. When I was in supply chain, I worked on my APICS certification. And then right now, we've been having some negotiations, looking for opportunities to certify some product line management. So they're always willing, I feel like to go the extra mile to train us to be more proficient in our job. 09:31 Amanda Hammett: That's really cool. Now, besides the additional training, and continuing education, and the tuition reimbursement, that's fantastic. 09:56 Jordan Donovan: Well, like I said, if you look at my resume, I've been here 13 years. They typically promote within, when possible, so I feel like that's kind of a leg up over external candidates. The tuition reimbursement. We're heavily involved in the community; we do the Habitat builds every year, the Big Brothers Big Sisters. They offered a SOAR programs. So I did a shortened version of the SOAR women's leadership training. And then, through our women's networking program here, I've been able to attend several conferences for Women Leading Kentucky, and so forth. So just to network with women outside the organization. So just trading stories and successes, so that's been good too. 10:36 Amanda Hammett: Oh, actually, that's how I came into Valvoline, was through your women's group. So it's a great little group. Not little, actually, it's not little at all. [chuckle] But it's wonderful. You guys do a lot of really fantastic things at Valvoline as far as just building company loyalty to the company with the employees, and things like that. I noticed that when I was walking around that you could just see a sense of people were happy to be there. That's not always the case. 11:31 Amanda Hammett: Is there anything that you wish that the younger millennials or even up-and-coming Gen Z, is there anything that you wish that they knew as they were matriculating into the workforce? 11:40 Jordan Donovan: I think, just take opportunities, volunteer for things. When you come in, just have an open mind and a good positive attitude. I think that's gotten me pretty far. I think I'm easy to work with, I think people can approach me for questions, and if I don't know the answer, I can try to help them, or navigate them to someone who might. And like I said, probably three of my five roles here have been brand new to Valvoline, so no script was written, but I was willing to walk in and develop that so it was a learning together with my manager. But just being open to that. 12:15 Amanda Hammett: And this is totally kinda plays into that. But did failure and just trying to figure things out as you went along because if it was completely new and there was no script, there probably were some things that didn't work out so well, right? 12:31 Jordan Donovan: Right. So I guess I kind of developed that playbook by trial and elimination. So there's definitely things I learned from to avoid and you make mistakes as you're learning. They were new jobs so I think people were a little bit more open-minded, but it has, like I said, developed me and strengthened me for future roles just having that learning curve, I guess. 12:53 Amanda Hammett: I love it. I love it. I love when you're in and you have an opportunity to actually fail and sometimes that's the most freeing thing because you're like, "Alright. Well, that didn't work, so let's just get up and brush ourselves off and keep going." So gotta do it. 13:08 Amanda Hammett: That's fantastic. Well, is there anything that you wish that companies did that made the hiring process a little bit better? But let me actually change that up a little bit. The hiring process as you guys are bringing in new people, how it affects you. Is there anything that you wish that Valvoline, for instance, knew about that, how that affects you as a clerk? 13:38 Jordan Donovan: I think for us, just in some of the interview process, some of ours can be formal, they're more panel interviews. So I think sometimes we've been steering those away and point even more towards looking at their skill set, looking at their work experience or their past experiences if they're an internal candidate and just trying to leverage that more than just how they might interview or how they may look on a resume, how they work in real life situations. 14:05 Amanda Hammett: Right. And you guys do so much internal promotion, which is just phenomenal. I love it. So very cool. 14:14 Jordan Donovan: And for millennials, I think we have so many coming in. I laugh, I used to be the young one here and I'm like, "Now, I've been replaced by this whole new generation coming in." But I feel like they have so much insight and new ideas and they're just like a fresh breath to some... A lot of us have been here several years, so I think they can offer some unique perspective. I also laugh because I feel like so many of them that have these awesome internships they've had and this higher education. They come with so much to the table from the beginning. 15:14 Jordan Donovan: Like I'll look at some resumes of who we've interviewed. And I'm like, "They have amazing experiences already." 15:20 Amanda Hammett: Yeah. Absolutely. It is amazing some of the things that they're doing before they even get into the workforce, so it's just what can they do once they get there? 15:31 Jordan Donovan: Right. Yes. 15:33 Amanda Hammett: Wonderful. Well, Jordan, I really appreciate all of your insights. I love that you have had all this wonderful longevity at Valvoline. Very much breaking a stereotypical millennial mold there. So thank you, thank you, thank you for that and thank you for sharing with our audience about all of your experience and the ups and downs, and the not so fun parts of growing in your career. I love it. Is it okay if our audience reaches out to you on LinkedIn? 16:05 Jordan Donovan: Yes, I would love that. 16:06 Amanda Hammett: Well, perfect. I will put a link to your LinkedIn account in the show notes, but otherwise Jordan, it has been my pleasure. Thank you. 16:16 Amanda Hammett: Bye. Thank you. 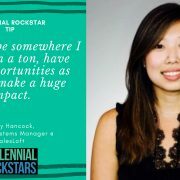 16:19 Amanda Hammett: Thanks so much for joining us for this episode of the Millennial Rockstar podcast. If you are looking for even more information on millennials and some free resources, visit my website at amandahammett.com. The link is below; it's amandahammett.com. There you can download a free Millennial Employee Engagement Guide that will give you all kinds of tips and tricks on how to keep those millennials engaged on a day-to-day basis because we all know that millennials who are happy at work are more productive at work. Mentoring Millennials is now more important than ever. The fate of our economy is focused on the transfer of knowledge from older generations to the millennial and gen z generations. That transfer of knowledge can easily be passed from Baby Boomers and Gen X'ers through mentoring millennials and Gen Z's. A good mentor relationship is a major foundational step to the long term success of our next generations. 00:01 Amanda Hammett: Hey, this is Amanda Hammett and this is the Millennial Rockstars Podcast. Hey and welcome to this episode of the Millennial Rockstar Podcast. Today's rock star is Anna Turner, who's in product development for a technology company. Now this is a super fantastic interview that I really, really enjoyed, because one of the best stories that Anna shared with us was about a mentor that she had early on in her career, and actually the lessons that that mentor taught her are still lessons that Anna uses today in her career. Now, not only that, but there is... She also shares with us a story about a boss who came later, who showed Anna an incredible sense of grace and flexibility when Anna really needed it the most. You see, Anna at the time was a mom to two young kids under the age of two and we all know when you're trying to deal with two kids under the age of two, you're basically just trying to survive. So Anna tells us all about that, what that time was like for her in her career and how her boss used that opportunity to instill a sense of loyalty in Anna. I can't wait for you to hear all about it. 01:06 AH: My name is Amanda Hammett, I am known as the millennial translator®, because I help companies attract, retain, and engage top millennial talent. 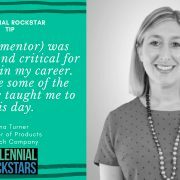 And today, speaking of top millennial talent on the Millennial Rockstar Podcast, we have Anna Turner. Anna, welcome to the show. 01:21 Anna Turner: Thanks Amanda for having me. 01:23 AH: I'm so excited to talk to you. Anna, why don't you just get us started, tell us a little bit about you. 01:29 AT: Sure. So, I'm Anna Turner. I work for an HR technology company, and I have been in software for my entire career, so I've been in high tech and have been in a role called product management and our role is really to figure out what types of things we want to build, new features, new products and to make that happen. 01:51 AH: That's really kind of an important but awesome role all at the same time. So tell us a little bit about how you... How did this come about, I mean when you were in college did you say, "Man, I wanna develop software". 02:06 AT: No, I did not. I, coming out of college knew that I wanted to move to Charleston, South Carolina, which is where I live now and at that time, the company that I was looking at, I was thinking about going into sales back then.  The company here that I was looking at was called Blackbaud and it is software for nonprofits and that was my first job. So I actually ended up going into HR as a recruiter and while I was in HR as a recruiter doing college recruiting, so we hired about 80 to 100 new college grads every year to come work for our company as software engineers, or sales people, or consultants, I had an opportunity to learn about what product management was and why it's an important role in software and fell in love with the idea of working in that job and eventually got an opportunity to start as a junior person in that department. 03:00 AH: That's really cool. Now was that also with Blackbaud? 03:03 AH: Awesome, awesome. Now, I will tell you that of course to be on the show, you have to be nominated by someone that you have worked for or with or maybe someone you've been in a vendor relationship with. But the person that nominated you actually was from your days in Blackbaud and she is somebody that I respect tremendously but she... She had so many great things to say about you. I couldn't even... I think you would be embarrassed if I sat here and listed them out for you. [chuckle] But I just, I loved what she had to say about you and just the fact that you are so detail-oriented and that you were just a real... You just get in there and figure it out. 03:45 AT: Well, thank you. Yeah, that person, Maree McMinn is absolutely amazing. She was a huge mentor for me when I moved into that role, it was my first time in product management. She is a rock star herself and pretty brilliant and so she was amazing because she kinda took me under her wing and led me through that role. But she also took the time to sit down with me and teach me things. She's a pricing expert, she's been doing it forever, she's unbelievable and she actually took the time to sit down and explain with me why she did things the way she did, and taught me some of her methodologies and I absolutely loved that. It was a huge growth opportunity for me, to be able to learn from someone like her and for her to stop and spend time with me to teach me. And I still use a lot of the things that she taught me, even today, which now a decade later from that job, and I still use what she taught me. 04:42 AH: That is awesome. I'm gonna have to make sure that she sees this when it comes out, because she is, she is a rock star completely, totally. And now let me... You mentioned this a little bit about... She took you under her wing and she mentored you a little bit. Was that something that she had to do or was it just something she chose to do on her own? 05:03 AT: She absolutely chose to do and I think saw an opportunity to help me. I mean, honestly, it was my first time in that role, it was kinda the first time I was seeing just some of the things that you see at work, like how to navigate, how to meet with executives, how to do different things, and she had done that. We were also good friends, so it wasn't just that, but she was really pretty amazing and pretty critical for me early in my career. 05:36 AH: Oh, that's awesome, I love it. Now, I would assume that... How long have you been out of college and in the professional world? 05:43 AT: About 15 years. 05:45 AH: A little while. Okay, so I would assume that there have been maybe a few stumbling blocks along the way. Have there been any stumbling blocks or we'll call them learning curves that you've had to face so far and tell us about those. 06:11 AT: Yeah, always learning, right? I had an opportunity about, now it's been almost about two years ago where the start-up that I had been at for six years, I was at that point, the Vice President of Product Management and we decided it was time to sell the company, and so I had lots of stumbling blocks during that process 'cause I had never been through it. It was incredibly challenging. I had to do things that were outside of my role, outside of my skillset, that were way above what I thought I could do and I had a lot of moments where thank goodness for some of the other amazing people I got to work with that they kind of stopped me and said, "Okay, you need to take a breath, you need to take a walk, you can do this, right, you've got this. And we're gonna get through it together." So a lot of times, I think it was actually me but the people around me that rallied around me to help me get across the finish line. That's how we did it. 07:13 AT: And that I really appreciate those people, whether it's me standing up in front of an entire executive team giving a technical overview, I'm not an engineer by trade, so that's quite a stretch. And for them to think that I know what I'm talking about, enough to buy our company, things like that were really hard. But I had people meeting with me after hours and on the weekends, trying to get me ready, so I'd be okay to do that. It was because of those people that I got across those stumbling blocks but a lot of it was actually kind of me. 07:45 AH: Okay, very good, very good. I love it when a good collaborative team effort comes together to pull everybody across the finish line. I mean, you see that in the best of scenarios. So I love, I love to hear that, that's great. Alright, now, let's switch gears just a tiny bit and we kinda touched on this, but I really wanna dive deep and this is more specific for our younger fresh out of college audience. You mentioned earlier that when you came out of college, you were looking originally to go into sales, but you didn't end up going into sales. So, were there any major reality checks that you faced coming fresh out of college and into the professional world? What you thought was working was gonna be like versus what it was actually like? 08:37 AT: Yes. I think for me coming straight out of school, I had amazing professors that definitely built all of us up that we could do anything, and the types of things looking back, that I was applying for coming out of college were definitely not jobs, I was equipped or able to do from a requirement standpoint, right? Coming out with a marketing degree I believed I could lead an entire marketing department. Well, that actually I have a marketing degree and could work in a marketing department, but probably not lead an entire team of people. And so I think for me over the years, especially coming straight out, I kinda had... It was a struggle of trying to reset that. Okay, this is a process. Just because I have gone to school doesn't mean that I actually have the expertise I need to do some of these jobs and I should be taking every opportunity to learn and that experience does matter and that it is, it is important to have not only the soft skills and degree but also the experience that comes with it. 09:46 AH: Oh, absolutely, absolutely. Well, we see that all the time, all the time. So okay, fantastic. Now, is there anything that your current boss or former boss or maybe even a mentor outside of Marie, is there anything that they're doing or have done in the past that really has kept you engaged and kept you motivated and kept you being productive? 10:10 AT: Yeah, I think for me, a lot of the people that I've worked for, that I have really wanted to go above and beyond for, I think a big piece has been that they have embraced and respected me, not only at work, but outside of work. So I had a amazing woman that I worked for named Kay Lucas, and she also had been through the stages that I was in at that point in time when I worked for her. My two children, who are now four and six, right? They were 15 months and a brand new baby. She always was really respectful about flexibility and very supportive and also kind of knew the struggles that I was going through. So that for me, just the grace that she gave me during that time in my life when things are really hard made me want to do whatever she needed, I would go to the ends of the earth for her because of how she treated me and took care of me during those kind of times where I needed a little extra grace. 11:19 AH: Oh [chuckle] yes, any time you have one child under two, much less two kids under two, you need a tremendous amount 'cause you're not sleeping and you're just trying to get through the day. 11:32 AT: Yes. So I think that's one. And then the other was just... I love when the people that I have worked with or that have been mentored me have given me opportunities to do things that are stretches, that maybe it's to come present to the executive team on something, and to actually have me present, and it might be a little rocky right but to give me that opportunity for growth. That's the other thing that Kay not only did but lots of people that I've worked for and it's so helpful as I'm trying to grow, to have those opportunities and I try to do the same thing for my team now. 12:10 AH: That's awesome. That's really, really, really awesome. So now you do have a team, and so you're in the position where you are doing the hiring. Is there anything that really makes an applicant stand out to you that makes you say, "Alright, this person is going to be a rock star." 12:28 AT: Yeah, I think a lot of it is soft skills for sure, how they interact with people, references, and a lot of it is hunger to learn. I look for people who are always wanting to learn. They don't think they're done. 12:48 AH: That's awesome. Now, when you say soft skills, what exactly do you mean? 12:54 AT: Yeah, so, in what we do in my group right there is a lot of managing up. You might be reporting out to executives. There is gonna be a lot of negotiation. There's a lot of partnership across different departments in our company, and so you have to be someone who can kinda navigate all of that, and a lot of that is the soft skills that come with it. 13:19 AH: Absolutely, absolutely, and that's something that I hear a lot of is that there is a real need for soft skills that come out of college and they're prepared with hard skills, but their soft skills tend to be a little less or a little more shaky, I guess. 13:34 AH: Okay, fantastic. Alright, so is there anything that you wish that younger employees knew, as they were going through the hiring process? 13:45 AT: That's a really good question. [chuckle] I think one of the things that is really important is to see everything as an opportunity. It might not be the exact job coming out with your degree that... Your dream job, that it might take you 15, 20 years to have that perfect dream job. But that every step along the way is a learning opportunity and you have to embrace it and see it as that and that even those very first jobs they matter so much to who you're gonna be and what you do and what you learn and to not lose sight on that, even if it's not your dream job right out of the gate, that's okay. 14:26 AH: Right. I'm so glad that you said that and you put it in such a beautiful way that I literally just wanna put that on an Instagram. [laughter] Because it is something... When I speak in colleges and universities still today, it's just like, "Well that's not my dream job" and it's like, "Wow, your dream job is not necessarily gonna come right now." [chuckle] I don't care what your professors or career services says. 14:56 AH: Yeah. Alright, now is there anything that you think employees or employers, or companies in particular, is there anything that you think that they need to do to make it easier or better for the younger employees as they're coming through, as they're matriculating through the entire system? 15:21 AT: Yes, I think there's definitely, and even if it's not at the employer level things that managers can do. One of the things they can do is spend time with their team, just understanding what is that career goal that that person is trying to work towards, and then being able to write as assignments or projects come up. As a manager, you can do a much better job of helping people get where they're trying to go just by knowing that and sometimes people don't ask "What are you trying to do? What's your end game? 15:56 AT: "How do I make sure that I'm helping you on that journey during your time with me"? So I think that's one thing, helping managers see how they can do that. I think for employers overall, one of the things that has been really important for me that I have really cherished and valued is flexibility. So in my current role, I work from home 75% of the time, which is a lot. At other companies I've been from home at least one day a week. Having flexibility with things from a corporate standpoint of PTO, unlimited PTO. I've had, at several companies, that's really, really nice as well. So I think some of those things that just really help you manage what you need to for who you are at work and who you are at home is the same person is really something that goes a long way for especially young working moms like me, that really does matter a lot. 16:54 AH: It's funny. You are out of all the people that I've interviewed so far, I think almost all of them have mentioned that flexibility piece. Almost every single one, especially the working moms, it's a challenge for sure, for sure. Fantastic. Well, Anna, thank you so much. I mean, this has been just bits and pieces that are just something to sink your teeth into, which I love. So is it okay if anybody in our audience wants to reach out to you on LinkedIn? 17:27 AH: Fantastic. Well, I will include a link to your profile in the show notes. But Anna, thank you so much and thank you guys for joining us for another episode of The Millennial Rockstar podcast. See you next time, bye. 17:41 AT: Bye. Thanks, Amanda. 17:44 AH: Thanks so much for joining us for this episode of The Millennial Rockstar podcast. If you are looking for even more information on Millennials and some free resources, visit my website at amandahammett.com. The link is below, it's amandahammett.com. There you can download a free millennial employee engagement guide that will give you all kinds of tips and tricks on how to keep those millennials engaged on a day-to-day basis. Because we all know that millennials who are happy at work are more productive at work.